« A Break in the Weather…and Fishing is Good! I Know…I’m Behind On Fishing Conditions!!! Great weather we have been having the past couple days, except for the WIND! However, I think it is coming to a screeching halt tonight and into Monday. Hit mid 70s today and the forecast for tomorrow’s high is 32 degrees! Can you believe that! Plus, we might get some periods of freezing drizzle in the a.m. Good news is back into the 50s by Wednesday and possibly low 60s by the weekend. Lots of wade time last Monday and a little time Tuesday afternoon. Generation all day Wednesday and Thursday morning. Just a little generation Friday, but they have run it all day both yesterday and again today, Sunday. Projection for Monday is low unit in the morning then two units on at 7:00 a.m. Then three at 8:00 a.m. It will drop back to 2 units at 9:00 and then back to a low one for eight hours. Darrell on the water last Sunday morning with Hugh from Florida. They had a really good day on the copper dun and copperhead black midges. Hugh had a nice 17 inch brown in his catch. Monday Shawn and Jackson from Texas spent the middle of the day on the water with Stan. Jackson is a very good 14 year old fly fisher. They had a really good day on the P&P midge, crackleback and tiger tail. The only negative that day was the 40 mph wind! Carolyn was out with Mike from Texas and they too had a very good day; mainly stripping the holographic green crackleback. Carolyn had a wonderful day Tuesday. She had the opportunity to take Katilyn and her grandfather, Jack, out for half a day. 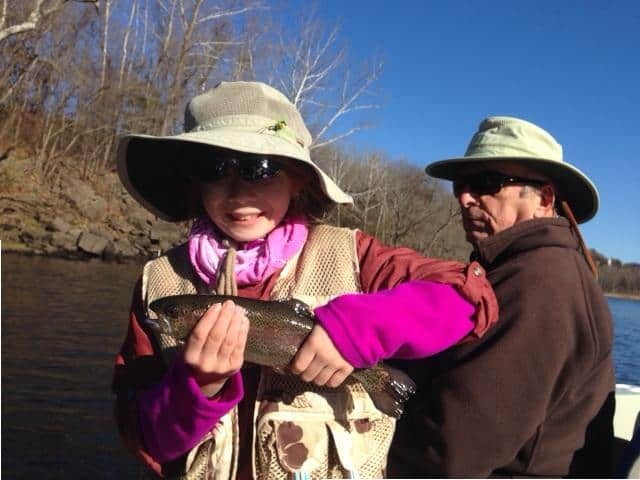 Katilyn is nine years old and this was her first time for trout with a fly rod. Fun day for everyone. 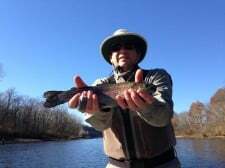 The bite was good and Katilyn landed her trout on the P&P midge with a copper dun dropper. We even let Jack catch some fish. Wednesday, Stan took Jim, from Springfield, and his friend Andrew, from California, out for half a day. Good day for these two guys on the big ruby with the black midge dropper. The water was running and was up and down all morning. Kind of a blustery cold and windy morning. Hugh (fished with Darrell on Sunday) brought a friend Ron this time and they spent the morning on the water with Darrell. Another good day for Hugh. He and Ron caught fish on the big ruby and a black copperhead midge dropper. Carolyn took soup and Ron and Kathy from Louisiana out for the day. It was a good day for these two on the #16 black midge dropped under the big ruby and later in the day on the high bank down from the Lookout Island, the blue poison midge dropper. 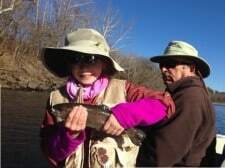 Kathy’s best of the day was a nice 17-1/2 inch rainbow. Gina had one of her regular regulars, Dale and his wife Lisa out Friday. Good day for Dale on the JQ streamer, a soft hackle and the P&P midge. Best and most fun of the day was stripping the streamer. Lots of bumps and plenty of hookups! Since 2007, Brenda and her son, Brandon have fished with Stan on the Friday after Thanksgiving. This was their best year ever, and almost every fish was on the P&P midge. This was probably one of their warmer years too! This entry was posted on Sunday, November 30th, 2014 at 5:55 pm	and is filed under Fishing Reports. You can follow any responses to this entry through the RSS 2.0 feed. You can leave a response, or trackback from your own site.